English Premier Cup top club Manchester United super star Wayne Rooney and his team mates showed up at Malacca Jonker Walk. The fans of Manchester United from Malacca were pleasantly surprised. Also known as Red Devil, Manchester United has tons of highly rated players. Under the administrative of present manager Sir Alex Ferguson, Manchester United is in high morale and has achieved a large number of brilliant victories. Without question, Wayne Rooney is definitely one of the best Manchester United strikers. He has contributed enormously to Manchester United. Actually, Wayne Rooney didn't emerge at Malacca Jonker Walk. Instead, his huge portrait was displayed at Malacca Jonker Walk cultural stage. 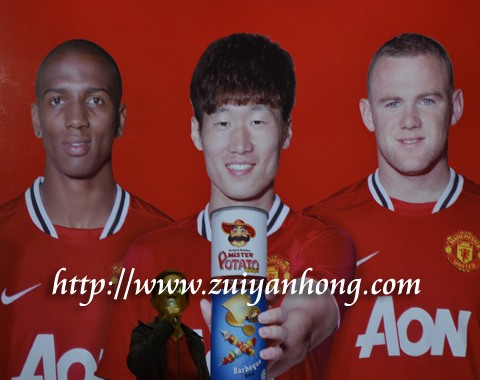 Besides Wayne Rooney, the cultural stage showcased the photo of Park Ji-Sung and Ashley Young too. It turns out that the best selling snack in Malaysia Mister Potato becomes the Official Global Snack Partner of Manchester United. Enjoy watching superb performance of Manchester United and savoring beer with crispy potato chips is a truly happiest moment.